If you are one of the millions of people who suffer from periodontal disease then it is likely that you will be undergoing some form of periodontal maintenance. 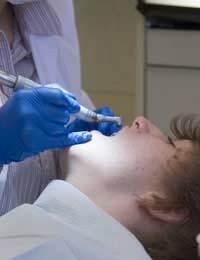 Periodontal maintenance is an ongoing process of cleanings and treatments used to keep the disease in check. Unless these treatments are performed regularly then the disease can spread causing more serious risks and complications to occur. People who suffer from periodontal disease will be required to visit the dentist more frequently than the recommended bi-annual visits. If the disease has been caught in the early stages then it may be easily treated by your dentist. However, if the infection has been left unchecked and allowed to progress into a serious condition, you may be referred to a periodontist who will asses the condition and recommend the best treatment. There are millions of people who are unaware that they have some form of periodontal disease, but the following symptoms may be a precursor to the disease. These symptoms will vary from individual to individual but if any of these symptoms do occur then an appointment with the dentist should be scheduled as soon as possible. If left untreated then periodontitis can occur, bringing with it additional risks to overall health. Periodontal disease is both preventable and treatable; the best treatment for your particular condition will be advised by either your dentist or periodontist. The frequency of the visits needed to address the condition will also be advised to you on your examination. Scaling and root planing is a common way to treat periodontal disease without the need for surgery. The bacteria and infection will be removed from the tooth below the gum line by scaling the tooth to remove tartar and also the plaque that has built up in this area. The next step will be to smooth down the area that has been scaled so that the plaque and tartar cannot once again become easily trapped in that particular area; this is known as planing the area. The process of scaling and rooting is often know as deep cleaning, and by leaving the root of the tooth healthy and clean, the gums will be able to reattach themselves to the tooth. The loose pockets around the teeth are reduced and it is harder for plaque and tartar to attack the teeth. Bone and tissue regeneration is a periodontal procedure that can be used if the disease has caused very serious damage. The bacteria and plaque will be removed from the teeth, and membranes, proteins and bone grafts will be placed on the area to stimulate tissue growth and allow the bones to regenerate. There are medications available to aid the maintenance of periodontal diseases. Medications can now be placed directly on the infected area to help eliminate the infection. There are also oral medicines that are specifically designed to combat periodontal disease. These oral medications help to enhance the body’s immune system in order to combat the bacteria that cause periodontal disease. Your periodontist or dentist will be able to advice if these medications are suitable for your condition. Periodontal maintenance must be combined with a daily routine of at home dental care in order to prevent infection from reoccurring. Daily brushing and flossing, along with good dental nutrition are the best ways to keep your gums and teeth free from infection. If you skip brushing for only one day then plaque can build up and a dental cleaning will be required to remove it. Periodontal maintenance is a continual process that needs to be taken as seriously as any other form of medical treatment. Your teeth are an important part of your body and need regular care and attention in order to keep them healthy and infection free.